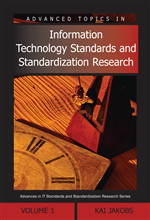 The author seeks to illustrate some of the ongoing problems that patents present for those seeking to standardize in the ICT field. The chapter illustrates these problems by drawing on patent and international trade disputes surrounding the rollout of IEEE 802.11 family (colloquially, “WiFi”) technologies during 2003 and 2004. It then presents several solutions including the introduction of a more systematic approach to dispute resolution by standards development organizations (SDOs) based around ADR procedures derived from the domain name Uniform Dispute Resolution Policy (UDRP), corresponding changes to dispute handling in international trade disputes and, in the long term, alternation to intellectual property laws to allow for appropriately-tailored standardization exceptions (at least at the level of interoperability).